Lord Ganesha is the most important deity to bring luck and prosperity in the life. Lord Ganesha’s every part carries significance. His head symbolizes the immense wisdom and prosperity of a person. Wisdom is extremely important which comes out of manana, ie independent thinking and reflection. This manana takes place when one has gain spiritual knowledge. The spiritual knowledge is portrayed as Lord Ganesha’s large ears where one listens to a teacher or preacher. This also symbolizes that even the wisest people are always alert to fresh ideas and opinions. Lord Ganesha’s trunk depicts a well developed intellectual and intelligent which arise out of wisdom, the elephant head. Intellect can be differentiated into two parts gross and subtle. The gross intellect is useful for the discrimination between the opposite pairs. The subtle intellect discriminates between the right and the wrong. If a person has realized the self then he or she has clarity of thinking and a clear sense of right and wrong. Choices become clear for them and life becomes simpler. Without clear thoughts, the worldview is bound to be confused and colored by our own wrong prejudice. Lord Ganesha’s well-shaped trunk depicts a clear indication that a person develops self-perfection. People who are self-realized are those who rise above the likes and dislikes and the pair of opposite that world gives them. They develop self-confidence, joys, and victories in each sphere of life. The two tusk of Lord Ganesha denotes the people who are genuine seekers on the on the spiritual path and have also achieved peace and wisdom in their life. The Lord Ganesha’s large stomach depicts the challenges which life throw at us. People attain supremacy and have the tremendous mental strength to remove the greatest setbacks of life. It leads to the joyous experience of life. The Lord’s posture with one foot on the ground and the other folded teaches that we must operate in the world but we should also have constant alignment with the Atman in and through all our experiences. We should be connected towards the soul. The food at the feet of Lord Ganesha depicts wealth and power. Through this, the Lord indicates that the worldly rewards those live a life. This shows command, respect and wealth even though it may not be desired. 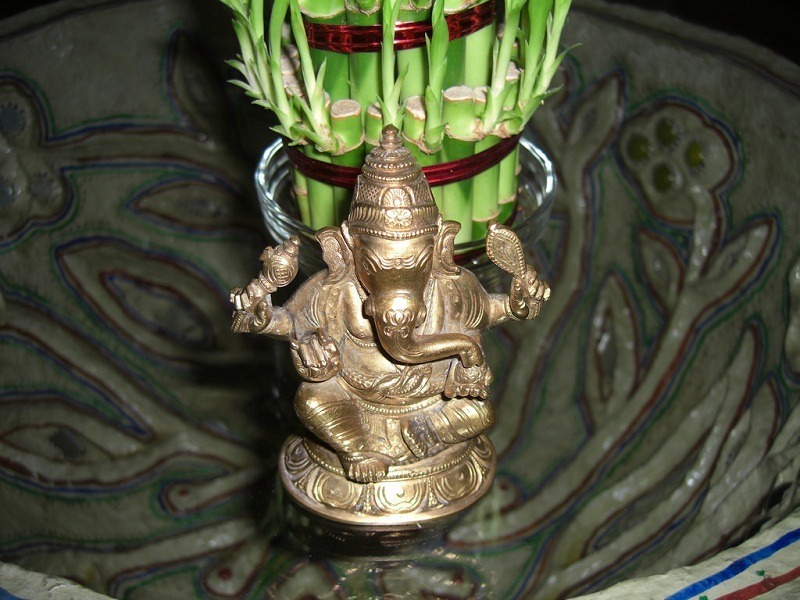 In his four hands, Lord Ganesha holds an axe, a rope, a modak (sweetened rice ball) and a lotus. The axe represents the desire. The rope is the spiritual knowledge which helps us to remove ourselves from the material world. The modak symbolizes the joy, happiness from the spiritual spirit. Lotus depicts the Divine state of self- realization that every human being inspires for. The lotus sustains and grows in the dirty pond but yet is above all the beauty. Lord Ganesha’s tale of wisdom is very unique. Lord Shiva and Devi Parvati arranged a contest between their two sons. The prize which was decided was the divine and spiritual food which carries the divine knowledge of the whole world. The competition was going to be around the world three times and then come back. In between the two who will complete the first will be declared the winner. Lord Kartikeya took peacock as his ride and Lord Ganesha knowing his size took mushuka (mice) as his ride as a disadvantage took three rounds around his parents. He prayed and worshipped them and stated that parents are itself the symbol of the world and then won the contest. Lord Ganesha is the destroyer of selfishness, pride, and vanity. All Hindus worship Lord Ganesha regardless of their belief.